The Travelon Anti-Theft Classic Slim Waist Pack features two locking compartments and a quick grab smartphone pocket. The front organizer compartment provides slots for 4 credit cards and a passport. The RFID blocking technology in the slots prevents identity theft by blocking readers from picking up personal data on any RFID emitting cards. The main compartment can hold an iPad mini and also has a smaller zippered pocket. 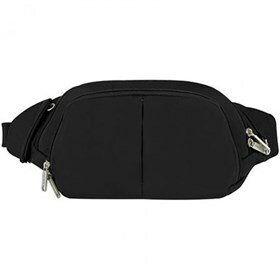 The Travelon Anti-Theft Classic Slim Waist Pack - Black has many exciting features for users of all types. You can extend the lifetime of your Travelon Anti-Theft Classic Slim Waist Pack - Black with the purchase of a FactoryOutletStore Factory Protection Plan. See the Travelon Anti-Theft Classic Slim Waist Pack - Black product video and gallery images above for more details. FactoryOutletStore stocks a full line of accessories like Boarding Pass Holder, Eye Mask, and Safe ID Classic Passport Case for the Travelon Anti-Theft Classic Slim Waist Pack - Black. The Travelon Anti-Theft Classic Slim Waist Pack - Black is sold as a Brand New Unopened Item.